March Madness is officially upon us # . Thus, I am preternaturally compelled to join the countless throngs who feel obliged to throw $20 to the college basketball winds in hopes of living out their very own Cinderella story. Fortunately, I know someone who does. In fact, he’s got hands-on experience with the alluring indiscriminateness that is NCAA basketball. One might even call him an “insider,” if one was feeling so bold. Regardless, after hours of brewing his distinguished expertise with my deft betting hand, I think we just may have distilled an almost-surefire, all-but-guaranteed-to-win, how-could-this-possibly-go-wrong March Madness bracket that one can be proud to staple a Jackson to. 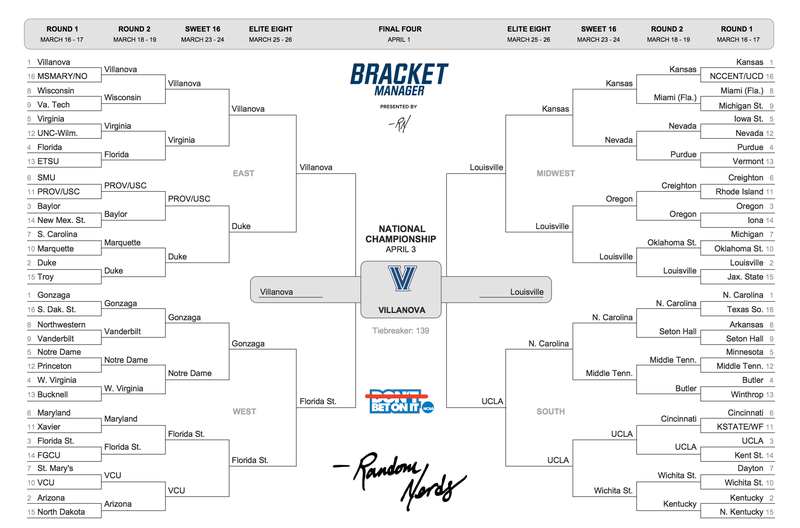 As you’ll see, there are more than a few notable upsets (sorry SMU and Kentucky) on there, as well as a few heavy sleepers worth being woke to (VCU, Nevada); though mostly what you’ll see is a sheet that shall remain unblemished all the way through April 3rd — when Villanova beats Louisville, combined score 139.